There’s nothing like getting back to a school routine to make you want to organize the kids rooms and really clean them inside and out. That’s what I’ve been working on mostly for the past two weeks. 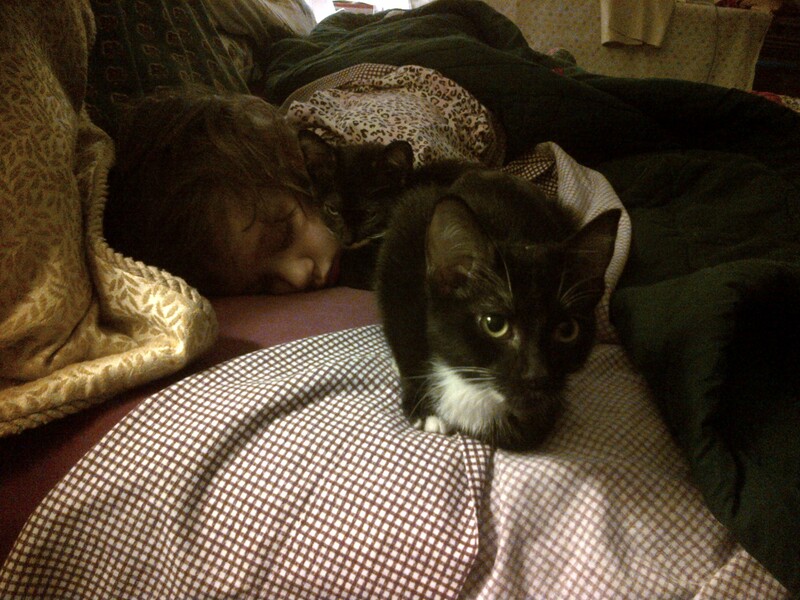 The hideousness of my son’s room was too much to share on a public website. But I’m happy to say that we are 90% done. That excludes the decorating effects. That is just picking up the accumulated crap. We have about 4 big bins of toys to donate, I’ve thrown out at least three full trash bags and we still have to go through his clothes. Next up – my daughter’s room. We are pulling up the carpet in her room, and exposing the fairly decent hardwood floors in there also. My intention is to re-carpet again – but I’m waiting to decide after I see it all cleared out. Again, I want her to love to be in her room again for all the reasons pointed out above. 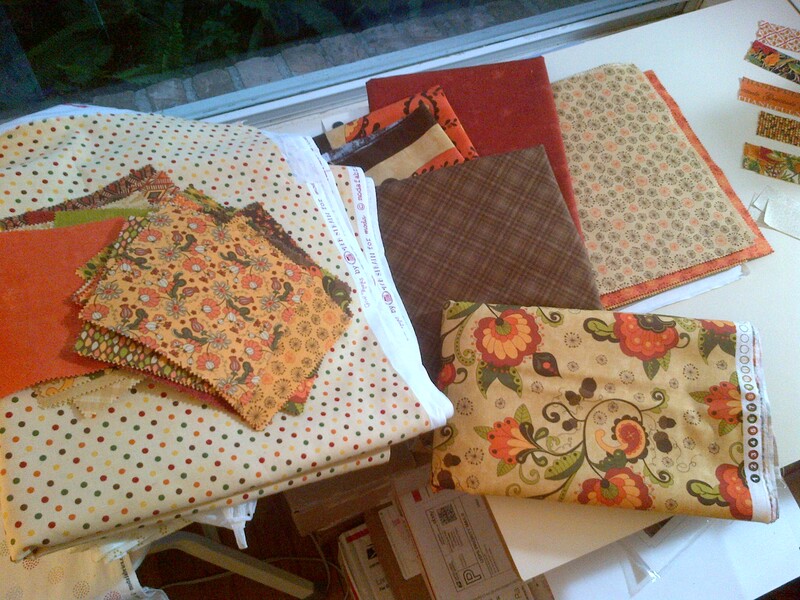 I did get a couple blocks made to finish up the series of the 2013 Designer’s Mystery BOM quilt. Block 12 is on the left. The great thing about this block is even though I may have cut the 1/4′ indention a bit close on some of the sides, when it is pieced into the quilt, this block is very forgiving. You won’t be able to tell. I also got back my AYOS Clover quilt this past week. It is going to a friend and co-worker that just recently had to return to Colombia. She had been in the states for 6 years, but her application was denied to stay longer. She hopes to reapply again in a year and come back. We have an office branch in Colombia as well, so we still work together – but it is now over phone/email and Skype webcams. The times I visited her apartment, I noticed that she had a preference to autumn colors. I hope she likes this lap quilt. Linh at LiMa Sews did the quilting for me and it turned out great. She had no problem with my border of prairie points. 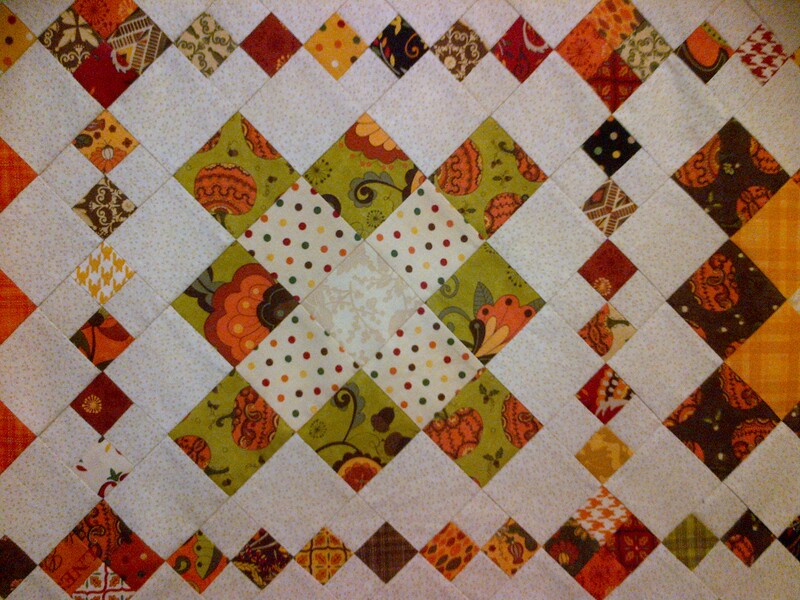 Can you see the oak leaf design she worked into the main part of the quilt? I love the back too – lots of pretty polka dots! I have to get the binding on before Monday if I want to send it for free with my boss on his trip to Colombia next week. Better get started! 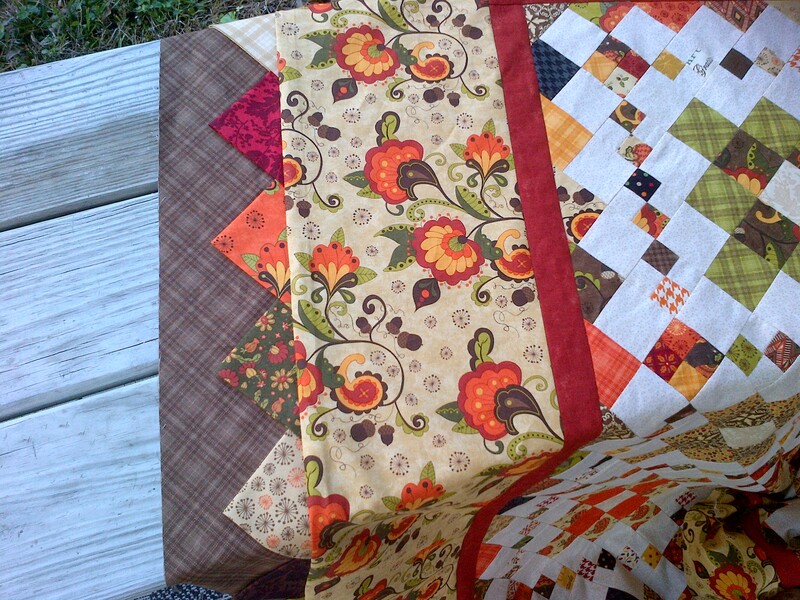 Hope you have time for some quilty adventures this weekend. Have fun and thanks for stopping by to visit! 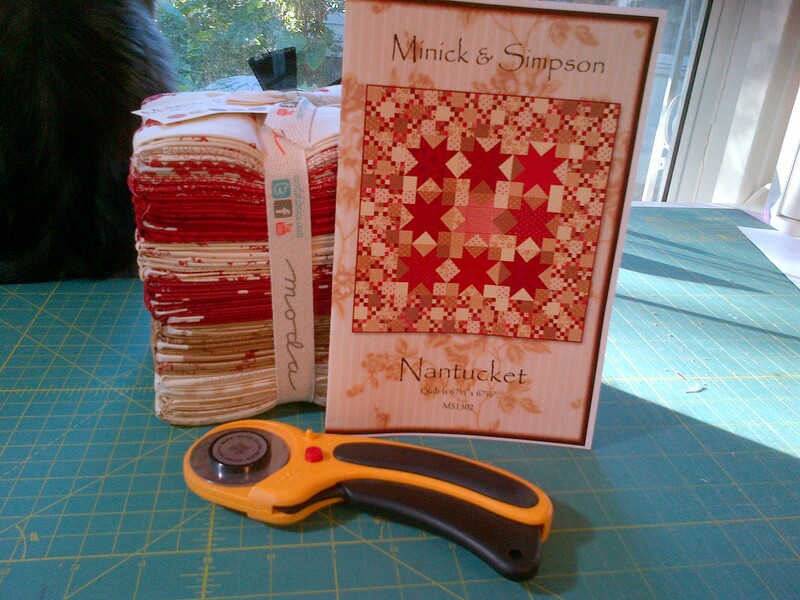 Some of my favorite bloggers are doing a sew along project, starting now, using the Midwinter Reds collection by Minick & Simpson. The pattern they are all doing is Nantucket (also by M&S). I had already decided that I loved, loved, loved this fabric and had also purchased this pattern. Hence – I am inviting myself to sew along with them and see how well I can keep up! 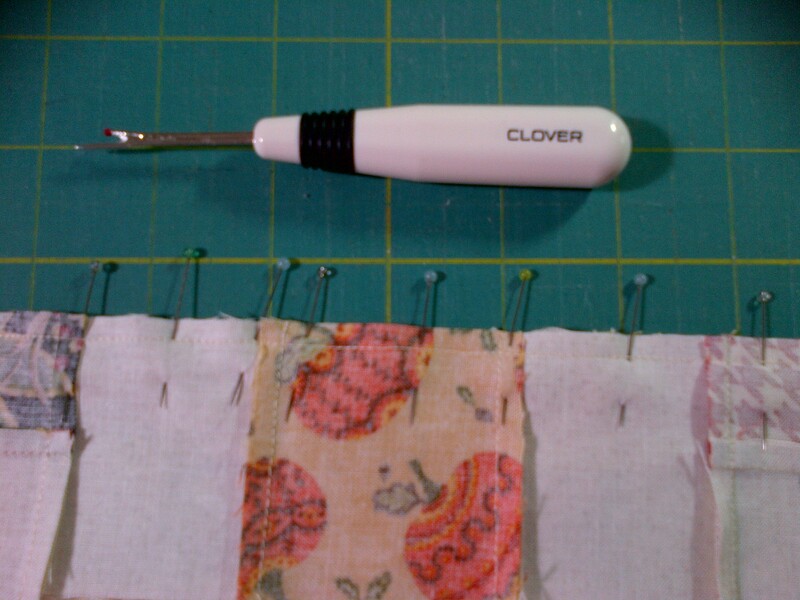 Click on my link to visit Nicole over at Sister’s Choice Quilts to read more about the sew along. Or click on this link to go over to Thelma at Cupcakes ‘n Daisies blog to read her post on it. Sinta, at Pink Pincushion hasn’t blogged yet on the sew along, look for it this week. And finally, there is Lisa over at Stashmaster and you can read her blog post too! Lots of girls doing the same quilt. Wonder how different they will all look when they are done? The lightest one will be in the center, similar to the pattern design. 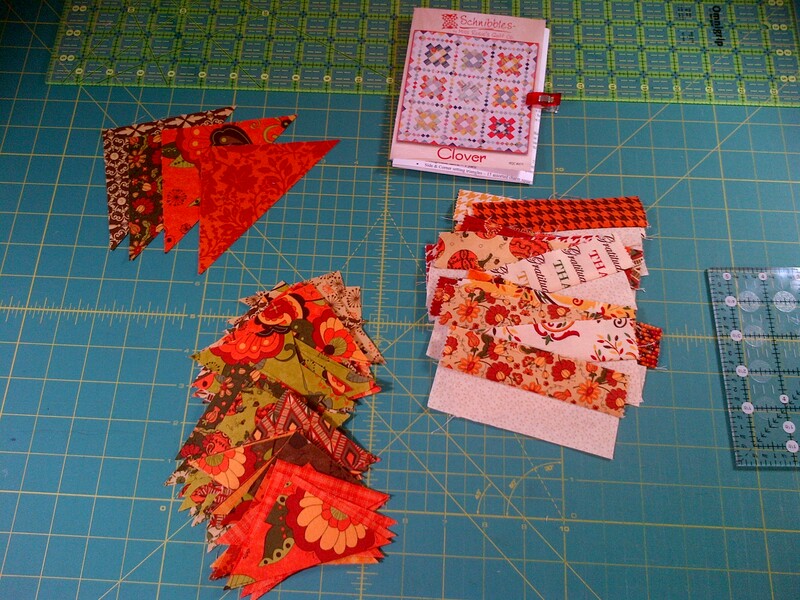 Here is my FQ bundle, all spread out. 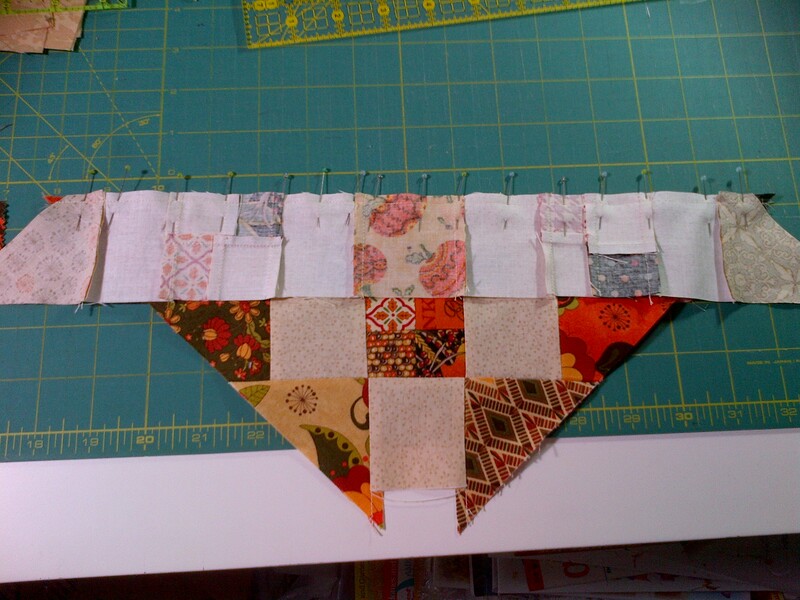 Once I take off that Moda Ribbon – it is a good sign I’ll actually get started on the quilt project.. 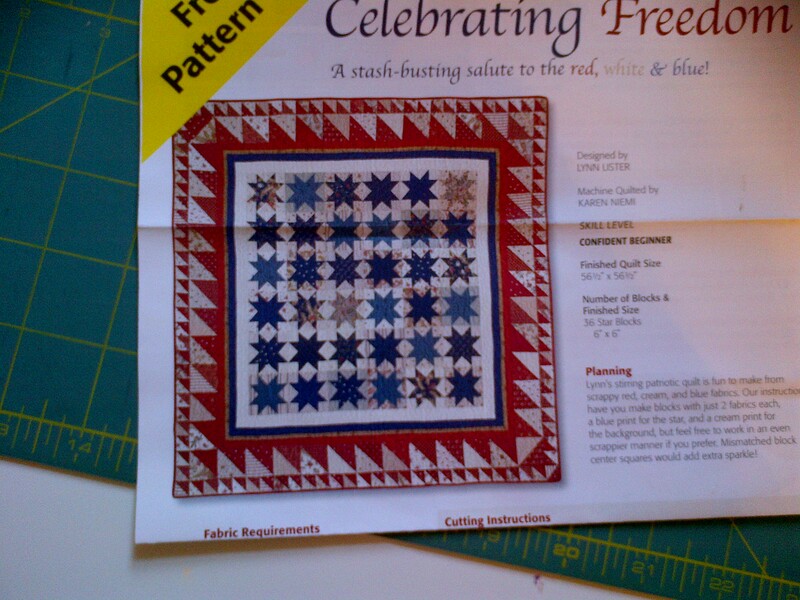 I had also thought of doing this pattern, that I got free as an insert to a quilting magazine subscription solicitation… I put it to a vote and Nantucket won out. When I asked why my husband voted for Nantucket – he said because “it looks more difficult”. Thanks Sweetie. I like the size of Nantucket more anyway though – I want to be able to use this as a lap quilt when I’m done. I had to finish up my Clover quilt top. I completed the basic pattern for the parade on Nov 1st … but I already had intentions on adding borders to make it larger. The pattern triangles seemed to call out for something similar in the borders – so I decided to try prairie points for the first time. I think it echos the design elements pretty well. I have them just on the top and bottom right now and still deciding if I’m going to do the sides. I think it looks good like this. What do you think? I need to do the borders on the sides – don’t I? I know the answer. … I’m just ready to move on to my new projects… I love this result though. 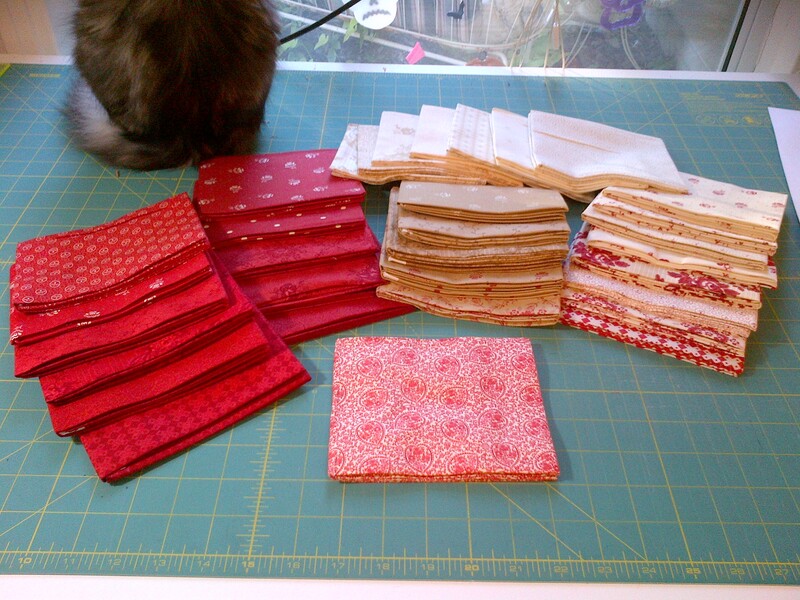 So – are you doing a Midwinter Red quilt project now? Perfect for Christmas, you know! Thanks for visiting today. 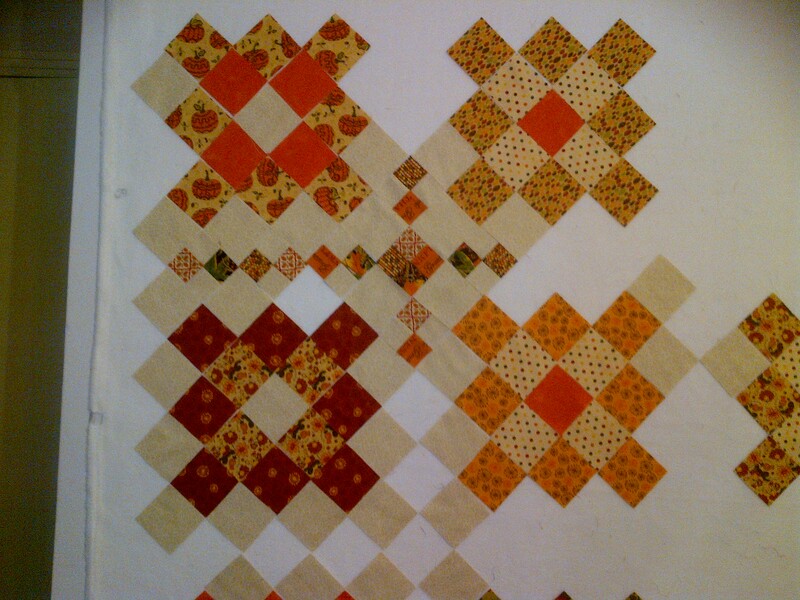 And THANK YOU to all the sweet readers who left me a comment on the Clover quilt. I appreciate it very much! Witching Hour – Made It!! I have 15 minutes to spare! 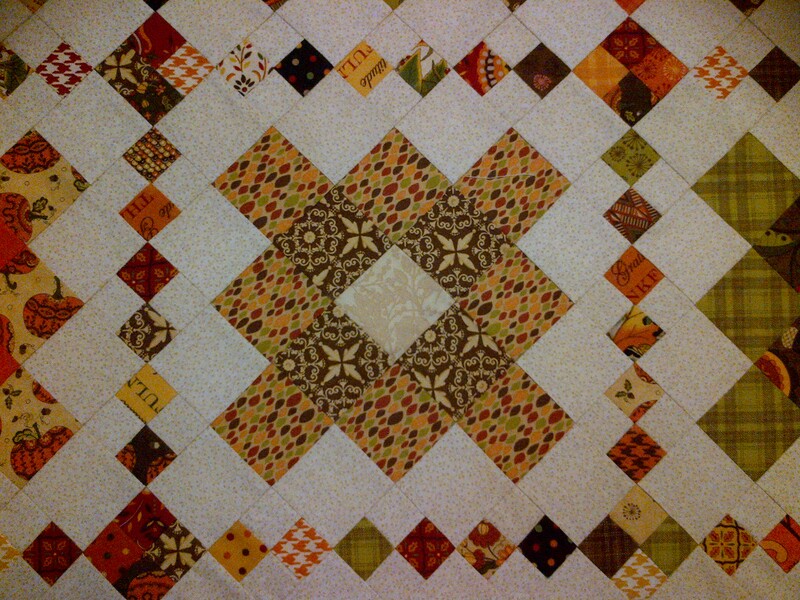 Clover quilt flimsy is DONE! D.O.N.E. That was a tough one for me. 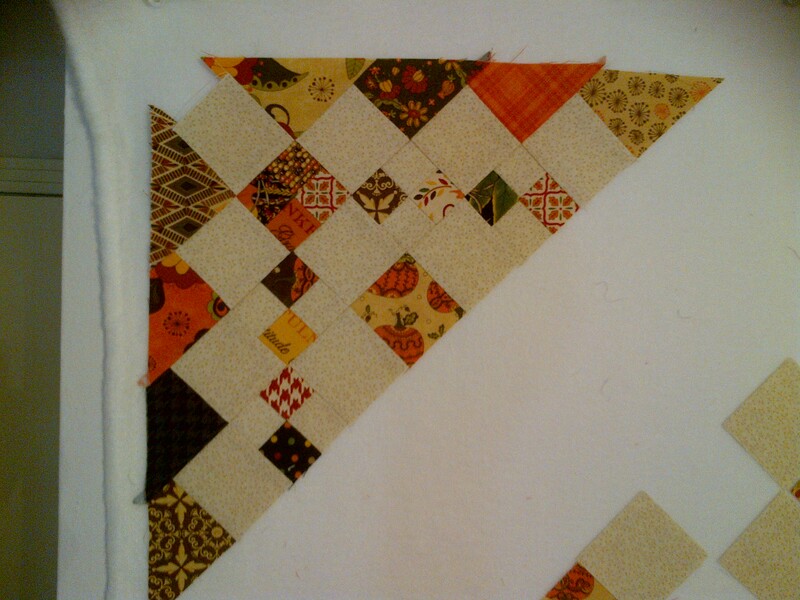 No actual blocks to put together, just square after square after square set on a diagonal. 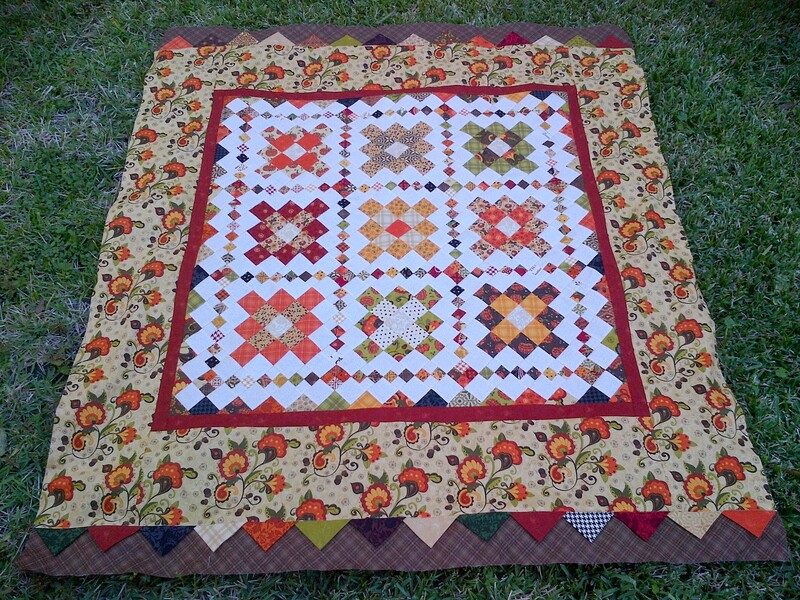 I’m happy to have the quilt though and I will be adding some borders to it before I FMQ it myself. It’s done just in time for the Thanksgiving holidays. 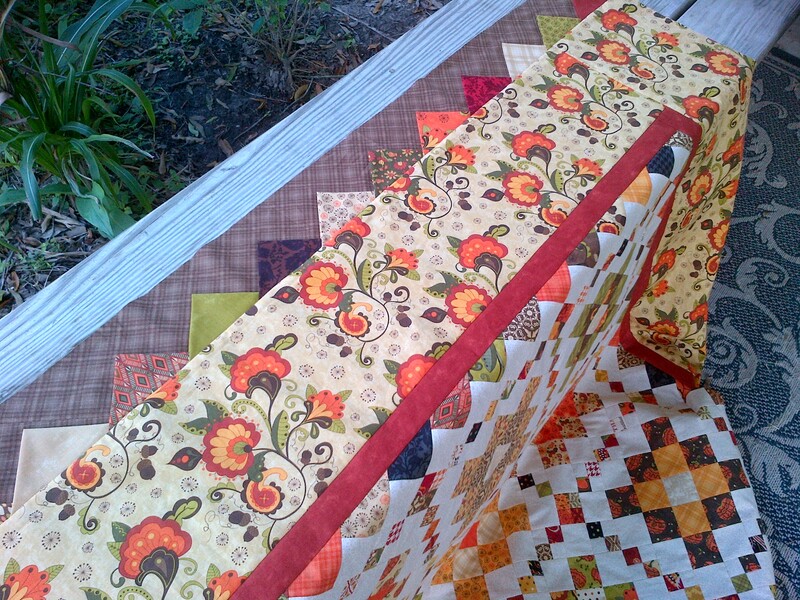 Fabric collection is mostly “Posh Pumpkins” by Sandy Gervais, but I had a charm pack of “Give Thanks” by Deb Strain that went into the four patch units. I haven’t measured it yet. It is something like 36″ square. I literally just trimmed the corners down and put it back up (barely) on my design wall so I could snap some pictures. This is my fourth completed AYOS project for this year. They are fun to do, but this one stressed me out. 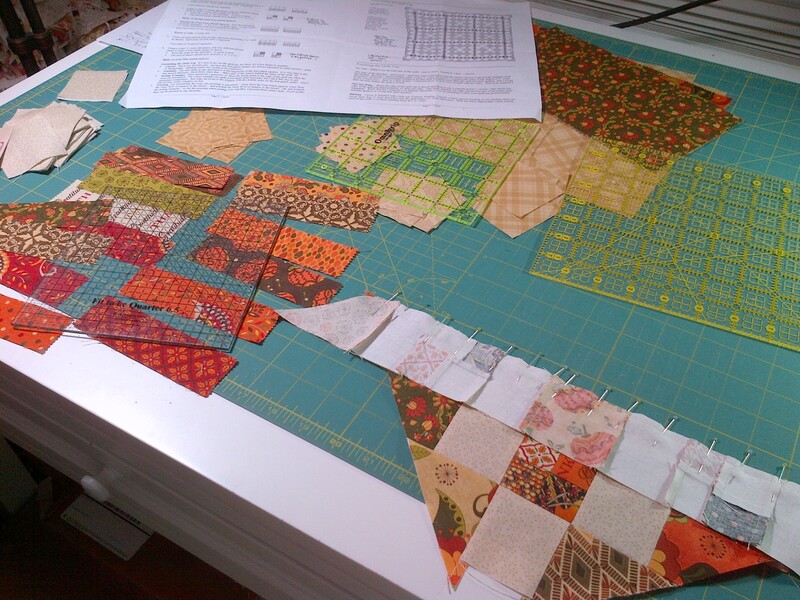 I’ll be skipping on the November AYOS because of another sew along I want to join and to get caught up on my BOM projects that are already underway and one that just started this month (Hampton Ridge). I look forward to seeing some other Clovers tomorrow in the AYOS parade hosted by Sinta and Sherri. 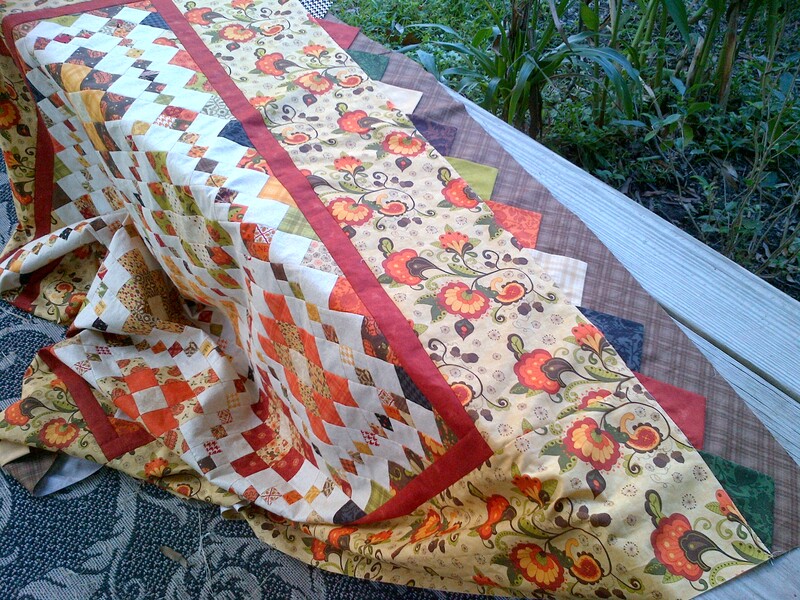 I need some ideas on how to quilt this top. Thanks for stopping by and I hope you and your family had a safe and happy Halloween tonight! Grabbed a couple of quick pics this morning on my way out. I am seeing a light. Only about 20 more 4 patch units to make and place on the design wall, then I can finish the assembly. 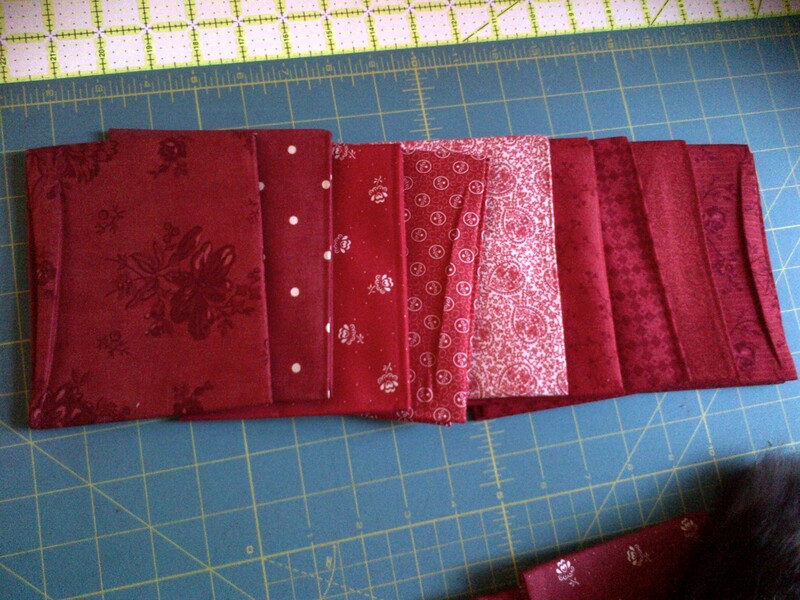 I have my strips sewn, just need to slice, dice and resew to make the units. Plenty of side triangles left to finish as well. The colors in this picture came out kind of neon for some reason. Looks much better in person. Here’s the updated design wall. 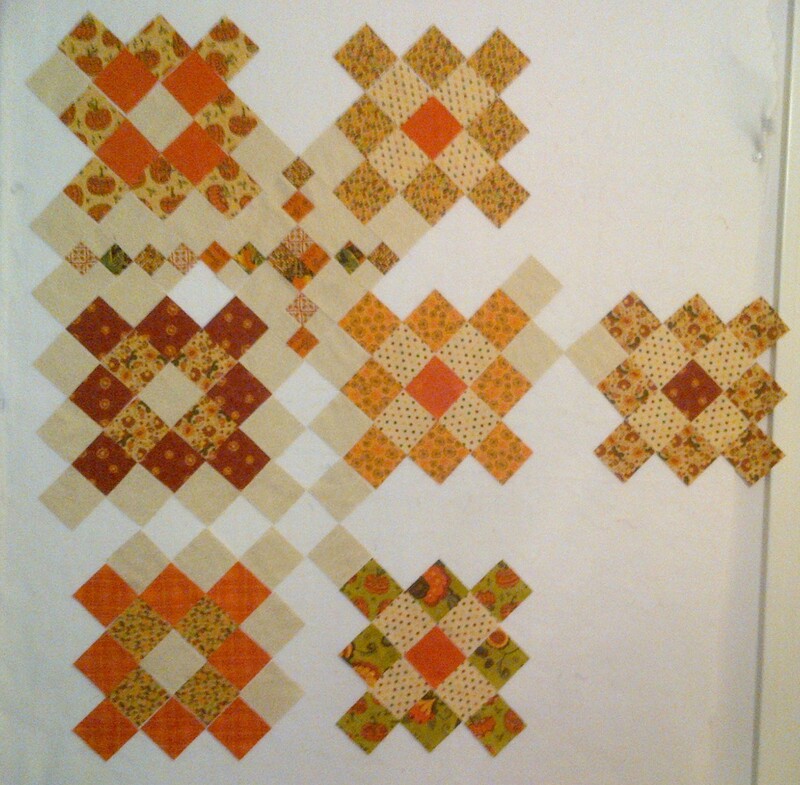 A few nights ago, I decided to get some momentum going and did some chain piecing of all the squares except 4 patch units. 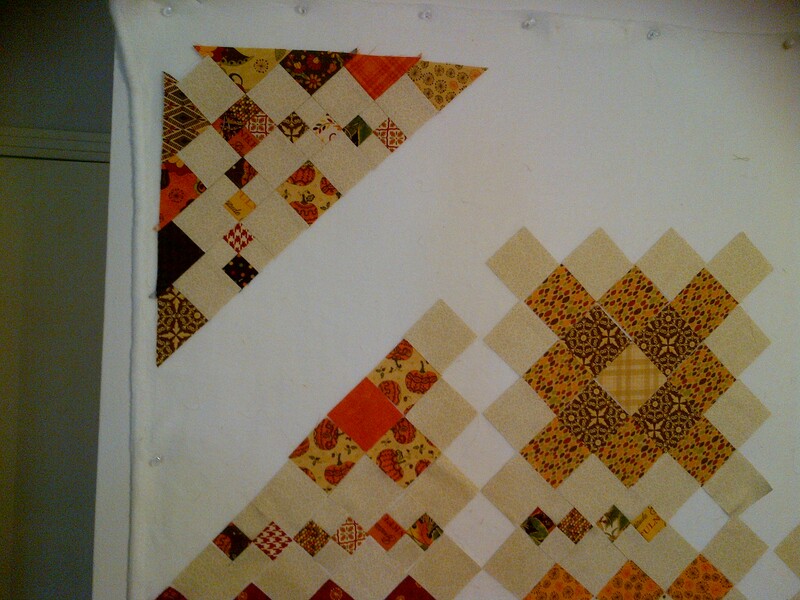 The rows that have the end setting triangles are already sewn together. The other rows are just stuck up there for now. A few more holes, rearranging and it should be a fast finish after that! I had already talked myself out of making the 5×5 setting, because it is just not as fun as I wanted it to be. 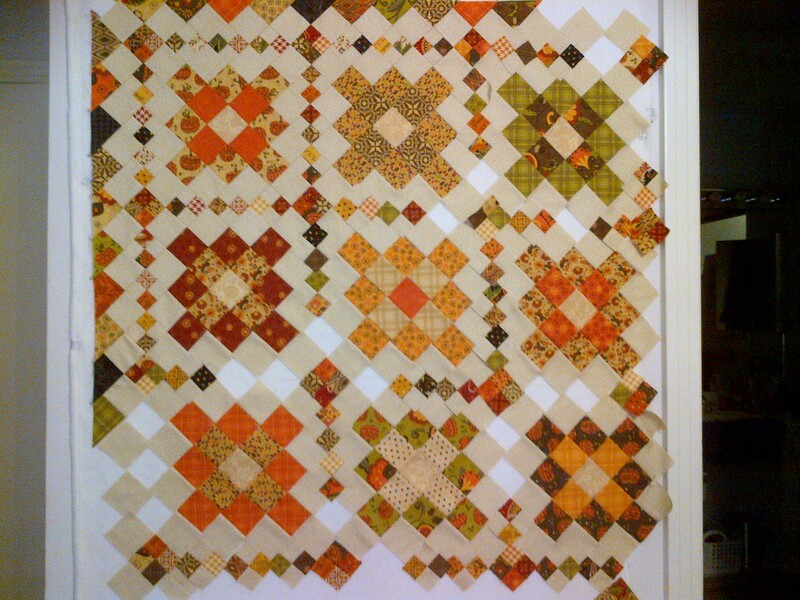 However, I have the matching pumpkin panel, so maybe just a single block with a pumpkin and two others to make this a 3×4 setting and with borders, it could be a good lap quilt. I’ll have to check out that math later tonight. Stay tuned! I started assembling a few rows together so I could get some instant gratification and see how much the layout would shrink as I went along. Assembling each individual block together and on point isn’t my favorite activity right now. I spent 3 hours last night putting together the first four rows while trying to keep them square (or triangle if you prefer) as I added more. It was hard and I unpicked the stitches more than once. Once I got a row as ‘perfect’ as I could get it, I added the next one – but only after I had squared up the entire row individually first. Then I pinned the hell out of it before running it under the machine. This looks pretty good. It was also after 1:00 am this morning. Only four rows attached. And my big idea to make this thing BIGGER! OMG!! 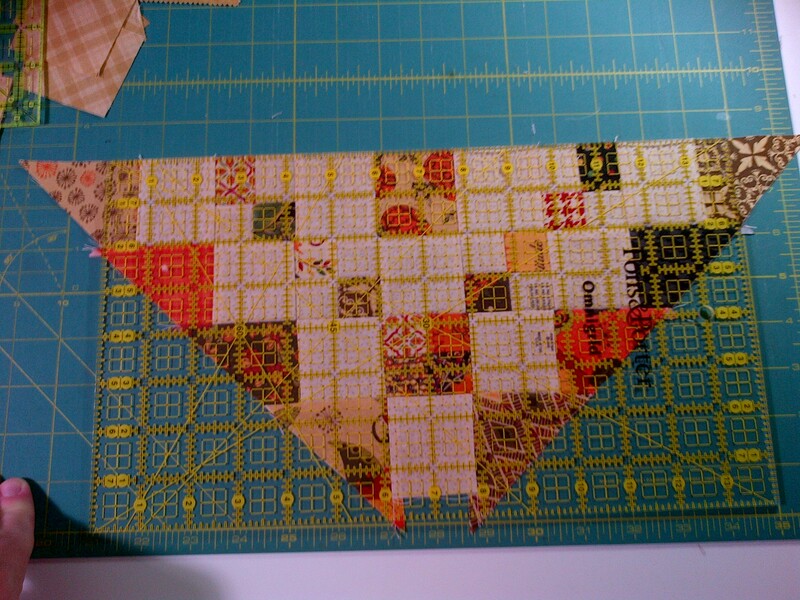 Carrie gives you large setting triangles so that you will have this 1/2′ cushion on the edge. This wee little corner looks pretty good to me. It does shrink up quite a bit. 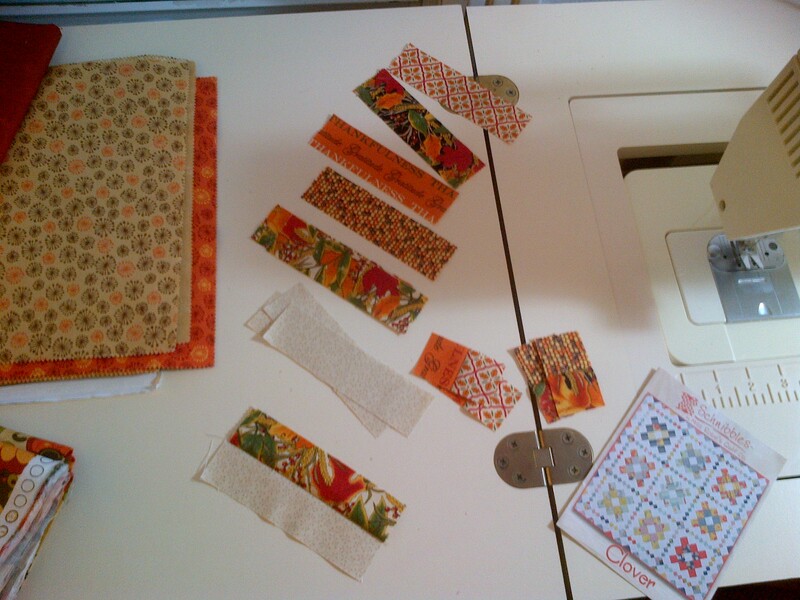 I have the next two rows sitting next to my sewing machine, so don’t think that what you see goes next to each other. 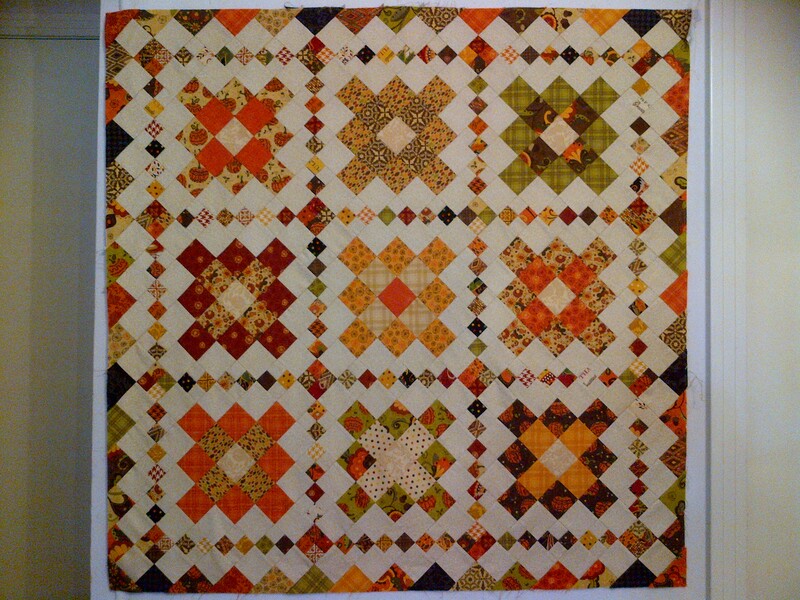 I still LOVE LOVE LOVE the colors and the fabric collections and the overall look of this quilt, so I will try to push on. I don’t know how far I’ll be by month end for the parade though. I’ll stay strong for now! All the best to you for a great weekend ahead! Design Wall Friday – a New Project! Oh boy – look what I have gotten into here. 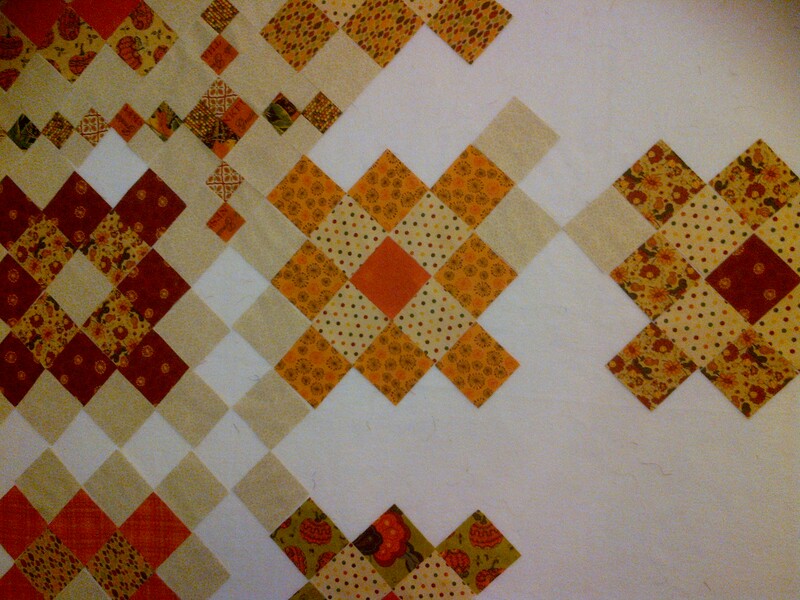 I am really REALLY liking this quilt already. My daughter stayed up later than she should while I was working on it last night, and she finally passed out to sleep in the guest bed. Have you gotten started yet? Thanks for stopping by for a visit! See you again real soon!